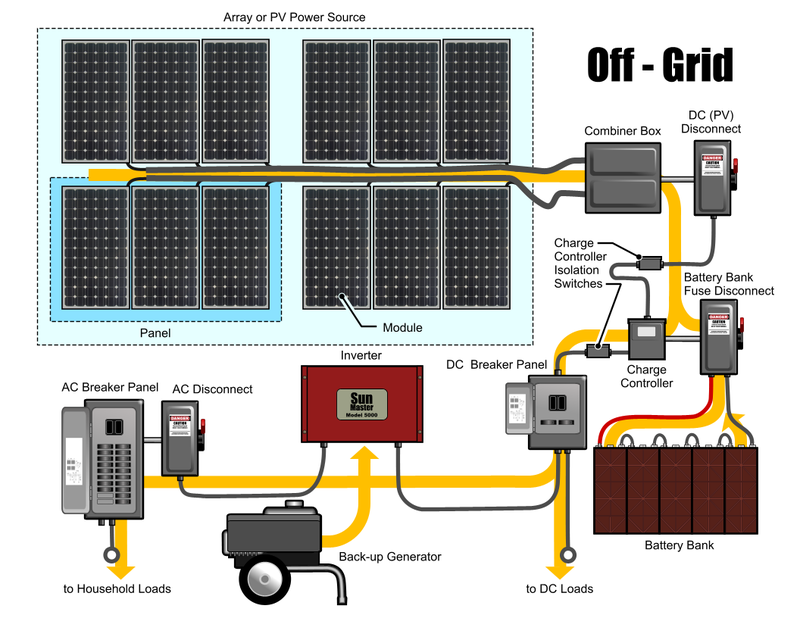 In a grid-direct system, your system is connected not only to your home but also to the local power grid. It allows you to “sell” unused power back to the utility company. Since there’s no sunshine at night, solar panels don’t generate any electricity at night and we have to rely on the local power company. For every watt hour you purchase from the power company, either have to pay for it or offset it by giving the power company extra power that you’re not using during the hours that your solar system is producing power. Here in the Cabo area, CFE (Mexico’s national electrical utility) will allow you to offset only the number of hours you consume during a given month. The disadvantage of this type of system is that in the event of a blackout, your system will automatically shut down. This is a safety feature that allows linemen from the utility company to repair whatever caused the problem without fearing that solar systems are pumping electricity down those power lines. If you are interested in having power during a blackout please see our battery-backup section below. In an Off-grid or Battery-backup system, you can store energy produced in a battery bank. Early in 2015 the Tesla company announced their Tesla Wall which is a battery bank designed specifically for home systems. However, there are many other options out there for battery backup. If you live in an area that is isolated from the CFE power grid (such as the East Cape) or would just like to live completely “off-grid”, this is the option for you. Some homeowners within San Jose del Cabo and Cabo San Lucas have chosen a Grid-direct system WITH battery backup so that they can still have power in the event of a blackout. Having a battery-backup can be a huge advantage if you live in an area where power outages are common. The main disadvantage with this type of system is the additional cost involved in purchasing a charge controller and a bank of batteries. For true power independence, this is best type of system to have and as you can see from the illustration below, can also accommodate a generator for double redundancy.